Casa Tjara is a beautifully designed, typical Canarian house with a large patio. The living room, the kitchen and the bedroom are grouped around this courtyard with its comfortable seating. From the same courtyard you also can reach the roof terrace via a staircase. This terrace is equipped with beautiful and comfortable furniture and allows a clear view of the sea and the surrounding mountains. The house has been completely renovated, the decoration is very elegant and the colors selected when designing are very pleasant for the eyes. 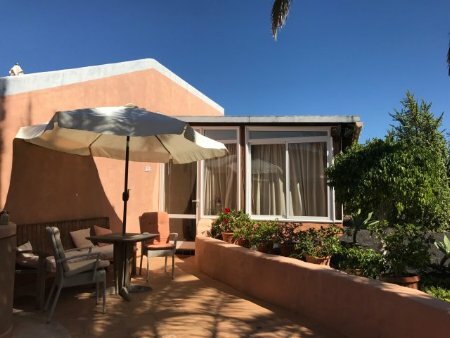 Together with the sheltered and sunny courtyard in the center of the building, right in front of living room and bedroom, as well as the roof terrace, a great holiday home has been created in a beautiful, lanzaroteischen ambience. A finca for true Lanzarote lovers! Casa Tjara has one bedroom and one bathroom, so can accommodate up to two people. There is also the possibility to rent both halves of the house, Casa Tjara and Casa Clara, so there is enough space for four, if necessary even for five people. Bed linen and towels will be provided. There is a washing machine in the house. We can organize either the transfer from/to the airport or as well the car rental. End-of-stay cleaning one daily rent. WIFI in the complex incl.